Picking up .40 S&W brass off the ground and reloading it can be a bit of a pain due to the number of bulged cases you can get (often, but not always, from Glock pistols). 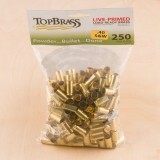 Grab our 40 cal brass to make your life easier while still saving a bundle over the cost of loaded ammo! Look for 40 SW brass casings from Jagemann and Top Brass with both primed and unprimed options in-stock for sale. Despite being descended from the 10mm Auto, which uses large pistol primers, the .40 S&W uses small pistol primers so if you're new to reloading, be sure to keep things straight and good luck! 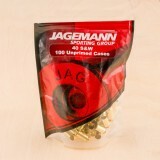 Add some great brass to your reloading supply with these new unprimed .40 S&W casings from Jagemann. Jag Brass, under the Jagemann Sporting Group label, is new production brass that undergoes a rigorous quality proofing process in order to offer reloaders casings which will hold up to multiple cycles and handloading without failure. Mercurial nitrite testing confirms corrosion resistance while multi-point Vickers Hardness testing ensures case strength all over. These rimless casings carry a maximum pressure rating of 35,000 PSI. 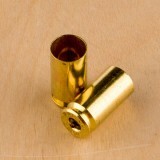 The brass casings are held to match-grade standards for quality fit and function and exceed the SAAMI standards. Jag Brass is produced by Jagemann Stamping Company, a manufacturer and fabricator of metal and plastic parts since 1946. Jagemann's use of expert personnel, precise modern machinery, and exacting quality control has netted them a reputation across many industries for their small parts. Their brass, which comes from their Wisconsin location, is used as an OEM component in many brands of off-the-shelf ammunition. Top Brass reconditioned and primed casings are a great choice for easy reloading. These 40 S&W casings are once fired and have been reconditioned, cleaned, full-length sized and primed with CCI #500 primers. Top Brass Incorporated is located in Colorado and specializes in purchasing once fired brass casings from the Department of Defense. You can expect to a variety of headstmaps in this bag of 250. 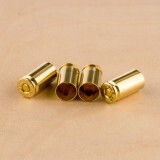 Don't forget to check out Widener's great selection of 40 Caliber Bullets, while you're here. 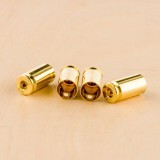 Top Brass casings are a high quality choice for you next batch of custom bench loads. 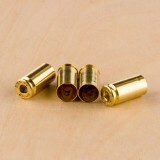 These 40 S&W casings are 100% factory fresh, never fired, new brass that bear the "Top Brass" head stamp. Top Brass Incorporated is a Colorado based company that specializes in purchasing one fired brass cases from the Department of Defense. Aside from reconditioning cases, Top Brass also offers quality new production casings. 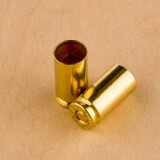 Top Brass casings are a great choice for your custom bench loads. These 40 S&W casings are once fired and have been cleaned, full-length sized and re-primed with CCI #500 primers. In this bag of 1000 you can expect to see a large variety of headstamps. Top Brass Incorporated is a Colorado based company that specializes in purchasing once fired brass casings from the Department of Defense. 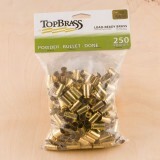 Pick up this bulk bag of freshly reconditioned brass casings for easier re-loading! 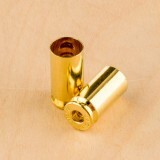 Top Brass casings are a great choice for your custom bench loads. These 40 S&W casings are 100% new production, never fired, un-primed and they bear Top Brass headstamps. Top Brass Incorporated is a Colorado based company that specializes in purchasing once fire brass from the Department of Defense. They offer several calibers of new production and once fired brass.